The Phalaenopsis Orchid is the most commonly found orchid. They can be purchased just about anywhere that sells flowers and indoor plants. Phalaenopsis are extremely common because they are easily available everywhere, are the easiest to grow and re-bloom under home conditions, and have long-lasting flowers that are colorful and some are even blossom with a sweet fragrance. You may also hear these referred to as Moth Orchids because the blooming flowers are said to look like moths in flight. Within the Horticulture community, this Orchid is also referenced as “phal” from time to time as well. They are found in just about every color. You name it and this orchid has it, except for blue. They even come in patterned and blotched designs these days. Phalaenopsis Orchid care is simple, which is best for a first-timer because it ensures they will not be disappointed! Our Great Tips to Keeping Your Flower Alive! Phalaenopsis Orchids are primarily indoor orchids because they require constant temperatures above 60 degrees in order to survive. This variety is considered a “low light orchid” and does not like full sunlight. 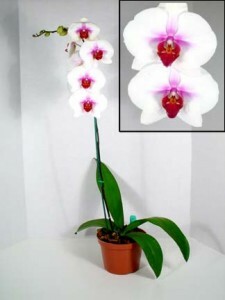 Place this orchid in a window that does not receive full light, or anywhere that gets indirect sunlight. Watch the color of your Phalaenopsis Orchid leaves, reducing sun if they look singed or turn lime green. When in bloom, you can move your Moth Orchid anywhere you would like to display. Your watering schedule depends entirely on what kind growing medium you are using. Using bark will require more often watering then if you are using moss. The heat and amount of sunlight hitting your indoor plant will also affect how often you need to water. Check your Phalaenopsis orchid daily and water if it feels dry. Feel the weight of the pot after watering and again when it needs watering. Eventually, you will get a feel for the difference in the weight or your orchid and will be able to use that to tell. Water this orchid in the morning using tap water, not salt softened or distilled water. Let the water run through the growing medium and drain out of the bottom for about a minute. Let the excess water drain out before returning your Phalaenopsis Orchid back to its home. If you see excess water in the crown (the area where the Phalaenopsis Orchid leaves join together), towel dry it to avoid crown rot. Fertilization is essential when growing a Moth Orchid. Fertilizer is what encourages the indoor plant to produce flowers and bloom. Orchids will bloom only when healthy, and fertilizing will help get them to this point. Use a well-balanced formula (20-20-20 for example) at half strength every other week when watering. These Orchids only need to be repotted every other year. Air roots will appear and grow out of the soil when the Orchid is healthy. This is how Orchids collect moisture from the air when growing on trees. It does not mean that you need to repot your Orchid. The best time to repot your Orchid is just after the flowers have died. This is when your Phalaenopsis Orchid is starting to focus it’s energy on growing again instead of flowering. When Repotting a Phalaenopsis Orchid, you will want to find a pot that it only an inch or so larger than the current pot. If you give your Orchid more room than that, they will spend energy growing new roots. This will significantly increase the amount of time it will take to produce new blooms. Remove your Phalaenopsis Orchid from the old pot and remove any leftover growing medium. While using such a small pot, you do not want to keep any of the stale growing medium. Run the roots under some water if you run into problems. Hold the Orchid in place in the new pot and press in the new growing medium. Make sure that you use enough to fill all the gaps. Fill the pot to about the same level as the previous pot, ensuring that you do not cover the Phalaenopsis Orchid leaves, then water thoroughly.